Good mileage and time jump this week. Finally back to double digit hours. We had sub-zero temps in Colorado at the start of the week so I spent the time indoors on the treadmill. Got out mid-week and then finished by putting in some time at 10,000 feet. Mon [AM] – Treadmill 10M: Its a super cold sub-zero start to the week. Staying inside. I used to “man up” and go outside during these cold spells. Now I value my lungs and staying warm. Mon [PM] – Treadmill 5M: The great thing about the treadmill is being able to hop on quickly. Just shorts and go. Shirtless in January…in the basement! Tue [AM] – Treadmill 6M Intervals: Was ready to run harder but not outside again. So I played with speeds on the treadmill every mile. Nothing fancy. But I usually set it and forget it on the treadmill so playing with any dials is progress. Tue [PM] – Treadmill 5M Incline: GZ was doing all these incline treadmill workouts so I did a few bumps up then back down. Need to be more aggressive with it in the future. Wanted to test what 1% increases per mile did to my HR. Wed – Treadmill 7M: Just working too hard for no speed. Tired? Maybe this is my rest day. Thu – Treadmill 10M: About burnt out on this treadmill stuff. Starting to make things hurt that shouldn’t. Fri – Union Reservoir 10M: Good to be outside again! Sat – Turquoise Lake: Everything told me to run elsewhere but I missed the lake so I wanted to see how things were. Not a great running run but sure got my workout. 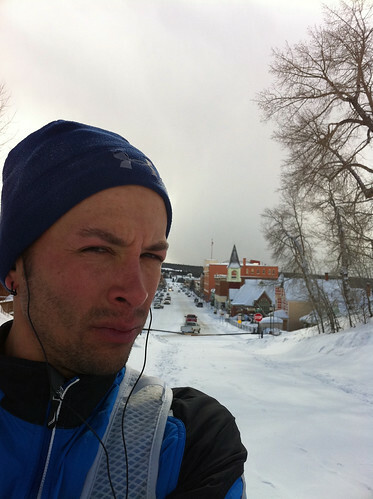 Sun [AM] – Leadville 6M: Streets were plowed so it made for a better run today. Kind of slippery through. Ran my usual downward start then up back to town for the full loop. Should have run further but I was getting chilled and had done my time. Sun [PM] – Treadmill 5M : Metered at the tunnel again on the way home. Just 2 light cycles worth. After the long time in the car, felt like a shake out run was in order on the treadmill. Kayla was with me and we watched Garfield together while I ran. Loads are continuing to go up and to the right. Not gaining too quickly though. 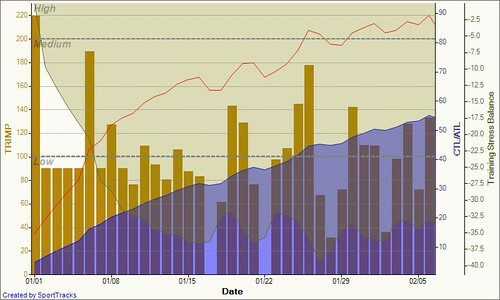 This seems to be because of my general tendency to keep my HR low on my workouts. I find comfort in the 140s and don’t get rewarded on this chart from it. TSB is still in the same range week to week. I am very comfortable holding in that range. I don’t feel sore, tired or fatigued at all. That is in contrast to last season at this time where I was pretty groggy on that level. Injury – Continues to linger. My ankle is good during runs but aches a lot while not running. Its moving around in there which usually leads to some good healing. My hip is stalled out. Just running on it as much as I can until “the shot” which is next week. On Saturday, I started getting this new phenomenon where the entire right leg locks up. Mostly in the back. Making me wonder if something larger is going on. Hoping the ultrasound reveals some truth. Lots of race chatter this weekend with the HR100 lottery and RR100 and all. Fun to get caught up in that but I am holding true to my plan. I have one mission and one goal. But the road to success means getting fixed first. And I am definitely not there yet. But running 70 miles on a broken chassis this week raises confidence that once healed I can raise my game. Again. This week I will look to holding and probably raising the targets again. Hoping to hit the local hills again this week too — for the first time in a month!